The most striking feature of Durga Bai’s paintings is their ability to tell a story. Each painting has a story — the stories that Durga Bai heard as a child are now translated into images in brilliant flamboyant colours .Her forms are mostly drawn from the pantheon of the Gond Pardhan community. She uses the motif of paddy seeds to infill the forms in her paintings.She has illustrated two children's books published by Tara publications called, One Two Three and Sultan Dreams.In 2004, Durga Bai was honoured by the Handicraft Development Council. 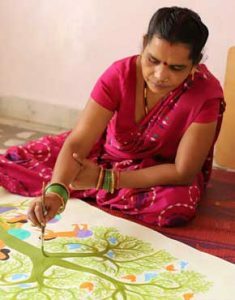 In 2008 she and two other Gond artists, Ram Singh Urveti and Bhajju Shyam, were presented the BolognaRagazzi Award in Italy for their illustrations in the children’s book, The Night Life of Trees, published by Tara Publishing. Durga Bai was also awarded the IGNCA Scholarship for 2006-2007.She has also illustrated for the book ‘Bhimayana”.